[London: 16th April 2018]: London City Island announces that the Fashion Business School at London College of Fashion, UAL will curate a unique exhibition, opening on Wednesday 25th April, at their landmark Leamouth Peninsula development. #FashionMeansBusiness seeks to showcase the very best of the Fashion Business School’s creative and entrepreneurial talent, from films and animation to interactive displays. The collaboration between EcoWorld Ballymore, arebyte and London College of Fashion, UAL will run from 25th – 29th April 2018, presenting student and graduate work from across all facets of the Fashion Business School. Hosted in arebyte’s gallery space, London City Island, the exhibition is open to the public from 12pm until 7pm Thursday – Saturday and until 4pm on Sunday. #FashionMeansBusiness is informed by the 4Ps – People, Planet, Profit and Purpose. These themes are at the heart of the Fashion Business School’s ethos, ensuring students are examples of social mobility, committed to positive social change through their work. The unique Pop-Up focuses on engaging audiences through meaningful, multichannel, and immersive content. 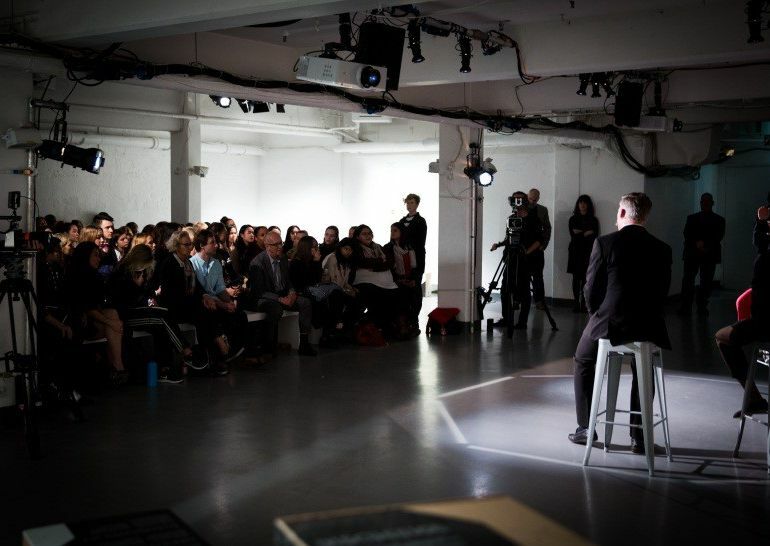 Guests are invited to participate through conversation and discussion at a number of events over the course of the exhibition, from London College of Fashion, UAL’s very own Fashion Clinic to its 21st Century Leaders seminar. The Fashion Clinic, in particular, is a new community for emerging and established fashion businesses, offering advice, networking and collaboration opportunities through regular panel discussions. This is indicative of London College of Fashion, UAL’s commitment to supporting entrepreneurs, across the fashion sector. The artwork on display is the product of advanced animation and digital processes from the Fashion Business School’s talented students. In accordance with the themes of People, Planet, Profit and Purpose, the digital installations will be accompanied by a number of cubed posters, while 2 metre abstract hangers will also be installed, providing detailed information on the academic foundation of each project. The #FashionMeansBusiness exhibition is the latest in a long line of creative activities at London City Island. Notably, arebyte and Trinity Art Studios have opened a variety of gallery and artistic workspaces, hosting pop-up exhibitions, industry discussions and workshops. Added to this, two of London’s foremost cultural institutions, English National Ballet and The London Film School, are relocating to the island and will soon open state of the art facilities for students and professional artists alike. Their relocation, in combination with a wide programme of independent gallery space, is reflective of a wider creative and cultural shift to the east of the capital, cementing London City Island as a new hub for the arts. Nurturing talent for over a century, London College of Fashion, UAL, is a world leader in fashion business, management, media and design education. Like many other creative institutions, London College of Fashion, UAL, will be relocating to the east of the capital; a move which will see the redefinition of traditional disciplines within the world of fashion education. John Mulryan, Managing Director of Ballymore Group, added: “#FashionMeansBusiness is the latest in a long line of exhibitions hosted on the island, a trend which we very much hope to continue. EcoWorld Ballymore’s collaboration with London College of Fashion and arebyte is indicative of the creative appeal of east London and we are very pleased to be at the heart of this cultural shift”. London City Island will comprise 1,700 new homes set on an island of 12 acres, with independent artisan restaurants, shops, creative hubs and al fresco spaces. The development takes its inspiration from the area’s maritime heritage, with bold primary colours and making use of its waterside surroundings with river walkways. Additionally, all Island residents will become members of the City Island Arts Club, the island’s own private residents’ club which includes a striking red swimming pool of bright, seafaring red tiles - the trademark hue which appears throughout the island.